What happens with a large TaxonomyHiddenList? 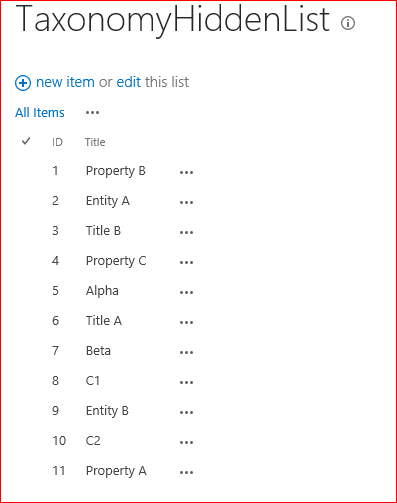 SharePoint’s Taxonomy (or “Managed Metadata”) fields are a bit strange in how they work. In a lot of ways they’re actually like a lookup field, and part of this lookup field is that site collections that use them have a hidden list – called TaxonomyHiddenList – in the root of the site collection. You can find it at /lists/TaxonomyHiddenList/. Each term that is used in a Taxonomy field has it’s label (actually, labels) and other details kind of ‘cached’ in this list, and there is a timer job that will push changes to the terms out into these lists – and therefore to items that refer to the entries in the list. You’ll notice that it has the term’s ID and termset ID in the taxonomy service (or ‘Managed Metadata service’). These are important if you want to get information about a term from the taxonomy service. … but to do this you need the LookupId of the item you’re looking for – so you’ll have to use the TaxonomyHiddenList to resolve that Term‘s GUID to the TaxonomyHiddenList‘s integer ID. What! No index? So if there are more than 5000 terms used in a Site collection there would be an exception? That can’t be right! Okay, let’s test it. I put 5001 terms into my TermSet, and created 5001 ListItem‘s that used those terms (1 each), and checked what happened. The event receivers that populate the TaxonomyHiddenList (the one that’s added to a list if you add a ‘Managed Metadata’ field to a list) clearly also create the indexes when the 5000 item count is reached. Okay, so there are indexes (indices?) – how would I query them? Well, I started by trying the following query on IdForTermSet and IdForTerm. This was a mistake. And that worked, despite the over 5000 terms, and I could use that ListItem‘s integer ID to query my other list using the LookupId, and therefore using that list’s index.